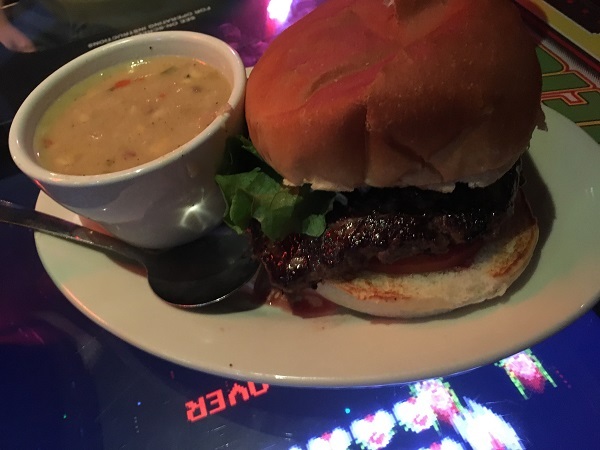 Tremont Tavern, Chattanooga TN (take two) – Marie, Let's Eat! We hadn’t gone back to have another of the most popular and tasty burgers in town since moving here. One Friday night, we braved the huge crowds and enjoyed some great food while looking at very old video games. You want to get a little bit of exercise? Come to Tremont Tavern on a Friday evening to meet your family like I did after work last month. You won’t find a place to park in the lot behind the popular restaurant. You’ll probably end up parking a quarter of a mile away. Then, if you’ve got a family like mine, you’ll see them standing around in front of the restaurant and wonder why on earth they’re milling outside instead of trying to claim a table. “Oh. Duh,” Marie said. It worked out just fine, because the only space available for the three of us was squeezing around a tabletop video game. Once upon a time, a machine like this would play only Ms. Pac-Man or Elevator Action. These days, it’s got sixty different games and demo screens for each of them. If you have a five year-old in tow, this is the greatest thing in the universe. How often does your table become an effective distraction to pass the time and keep your kindergartner from being bored? Then I made the mistake of saying I’d never enjoyed Donkey Kong – unlike these fanatics – and was obliged to explain why, at length. Marie, who finds classic video games even less entertaining than painful dental surgery, retreated to play modern puzzle games on her phone while I continued being interrogated about Mr. Do and Time Pilot. Our son struggled to understand how, once upon a time, people went to actual businesses called “arcades” to do nothing but play these games while standing up. It’s a far cry from his recent experiences lying on the sofa playing Lego Batman Race on Marie’s iPad. Eventually, but before QBert showed up and made his eyeballs hurt trying to discern which sides of the cubes were the tops and which the flat sides – come on, it wasn’t just me who couldn’t cope with the perspective of that damn game – our server came back and covered the video games with burgers. We hadn’t been by since our first visit three years ago, when we concurred that these were (then) the best burgers in the city. Now, fair’s fair, if I’m occasionally down on the barbecue around Chattanooga, this city more than makes up for it with fantastic places to get great burgers. 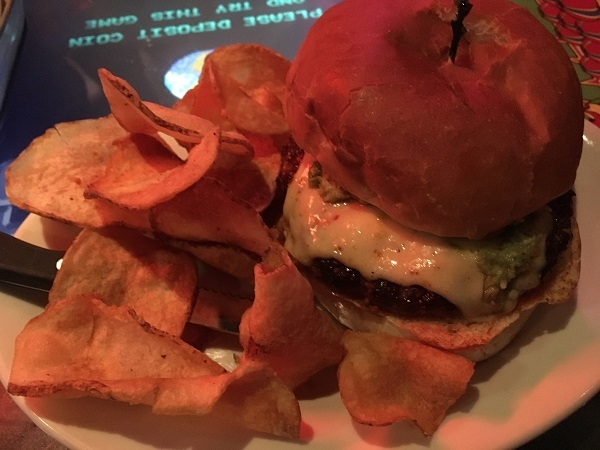 Marie had the Tavern Burger, and I tried their popular Chuck Fisher, which comes with guacamole and pepperjack cheese. There are possibly better circumstances under which to enjoy these burgers than being cramped in a very loud and love-filled room packed with happy people while a five year-old grills you about long-forgotten nostalgia. 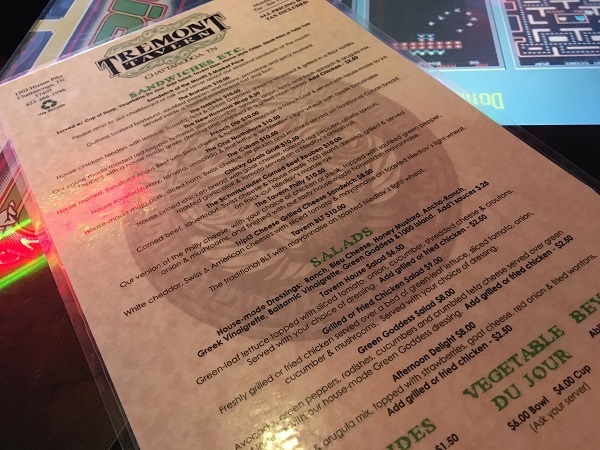 But the Tavern does a really good job managing the noise levels and have a fantastic staff of servers who can navigate the Friday night crowds. These are fabulous burgers, certainly among the best in town (Zarzour’s, Merv’s). If you’re after a quieter space, come by in the mid-afternoon. If you’re coming with friends, any time’s good. Posted on March 22, 2017 by Grant G.Posted in burgers, chattanooga, tennesseeTagged burgers, chattanooga, tennessee.